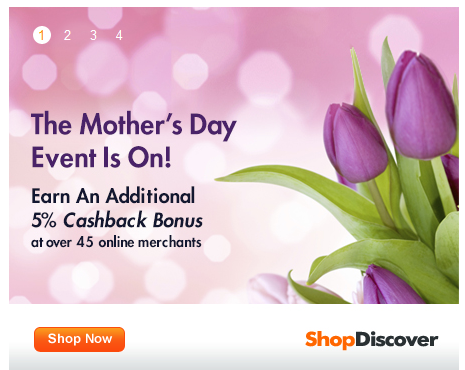 Now through Mothers Day you can get an extra 5% cashback from Shop Discover with 49 merchants if you use their portal to do your online shopping. There are some pretty significant bonus rebates here with some major retailers. The only merchant below that I found with a better deal on Ebates* is Magazines.com which they currently have at 40%. To find the list on the Shop Discover site, log in and then look for the graphic I picture to the right. Click on that image and it will take you to the filtered list of merchants. The terms generally aren't valid for purchase of gift certificates, taxes, fees or in combination with other promo deals. Check each merchant for specific rules. * Standard Ebates blurb:To get the cash back you need to be signed up with Ebates. Then simply go to Ebates to get the referral to the the store before you do your shopping. I also get a referral bonus if you use my links to sign up with Ebates.